Sinigang is a Filipino soup-based dish that is pleasantly sour and just a tiny bit spicy. A number of souring agents are used, the most popular of which is the tamarind. Calamansi can also be used, since tamarind is not always readily available. If my memory serves me right, I've also had sinigang with santol in it, complete with the seeds. My mouth is watering just by thinking about the santol! 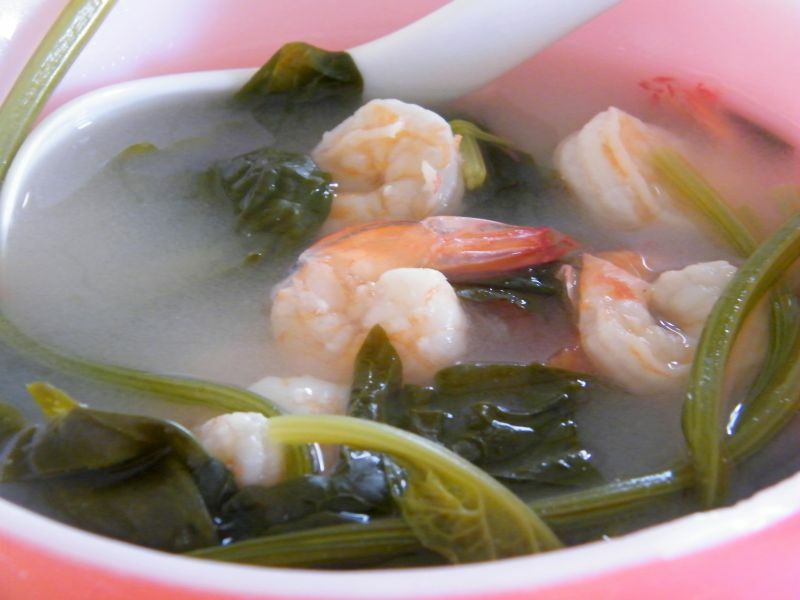 - We also added just one leafy vegetable, but sinigang can have other greens such as sitaw (string beans) and okra. This is the sinigang for when you are short in ingredients. Place the water, onion and tomato slices in a pot. Cover and bring to a boil over medium heat. Add the Sinigang Mix and let simmer for two minutes. Taste and adjust with salt or fish sauce. Add the shrimps and continue simmering for 5 minutes. Turn off the heat and add the kangkong. Keep covered for about 5 minutes more for the kangkong to cook. Serve with fish sauce (patis) on the side.